Chicago: M.A. Donohue & Co., 1904. Also includes three Christmas tales: The Fir Tree, A Shock!, and Sitting Up for Santa Claus. This is an early adaptation of Alice in Wonderland to a picture-book format. 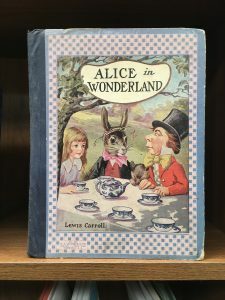 It includes the totally classic John Tenniel illustrations accompanying the text, and a wonderful color painting on the front cover which is clearly based on Tenniel’s sketches. The three Christmas stories also have black & white illustrations, and are included after the Alice story. Clearly, this was published just before Christmas, and would have been a cherished gift for some little boy or girl! The front cover, which is a big part of the value of this book, is in very good condition–only a little edgewear to the cover, but bright & clean image including the checkerboard border. 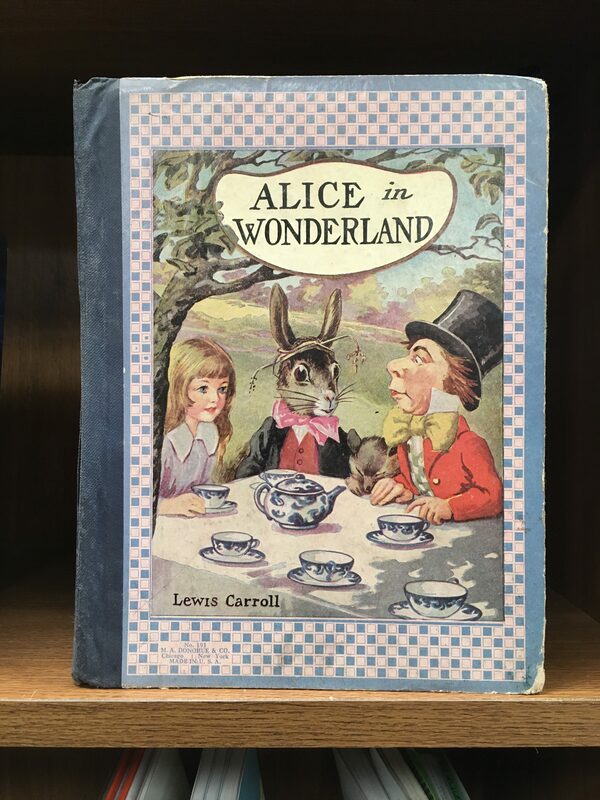 I see lots & lots of vintage children’s books come through our store, and I have to say that a glossy image on a paper-covered board just doesn’t look this good very often. And to have such a nice cover on a copy of Alice in Wonderland is a wonder! The book was cheaply made (probably wasn’t intended to last over a century! ), and the main condition flaws are toned paper (very acidic pulp paper was used–like stiff newsprint), and holes at the stapled binding (see photo). Other than those flaws, the book is in very good condition overall, especially for a classic children’s book as old and large as this is. Measures just under 10″ by 7-1/2″ wide.